In need of some precious ‘me-time’, just because ‘you-are-worth-it? You came to the right island! Bali is known as ‘the island of Gods’ and surely, you will be feeling like Gods and Goddesses after a trip to the spa! Another common nickname for Bali is ‘Paradise Island’ and I am sure that the pampering spa culture has got something to do with it! In Bali, spending time at the spa is a luxury everyone can afford. Back at home, getting a massage usually comes with a fierce price tag, but here on the island of Bali, you can go to the spa every day and it still won’t break your wallet. Every treatment at almost every spa starts with a footbath, cleaning your feet, warming and preparing the body for the relaxation to come. The Balinese massage is a soothing and relaxing, deep tissue massage using gentle long strokes, kneading, skin rolling, pounding, stretching and acupressure to stimulate blood flow, relieve toxins from the body and get rid of tension in muscles. Massage oils are extracted from local herbs and spices such as ginger, sandalwood, coconut, frangipani and jasmine. After the foot bath, you will be left alone to change into the disposable underwear and a sarong. Then, lie down on the massage bed with your face down and get ready for the bliss. The Balinese massage is a true ‘head-to-toe’ treatment – feet to scalp – front and back. Traditional music, sweet scents, stillness, the spa in Bali is a heavenly place, indeed! Try this treatment here. Lulur is an ancient Javanese beauty treatment, traditionally used by royal women engaged to be married. This daily ritual, starting 40 days prior to their wedding date, would make their skin smooth, soft, glowing and beautiful, increasing the chances of conception on their wedding night. These days, no marriage or wedding night is needed to experience this royal spa treatment. Lulur is an exfoliating scrub is made from natural ingredients such as rice, turmeric, ginger, pandan and essential oils, often followed by a yogurt body wrap to nurture the skin. The therapist gently applies the paste on the entire body, leaves it to dry and then, scrubs it off, eliminating dead skin cells with it. Rinse off under a warm shower and the yogurt body wrap is applied. Shower once again or go soak in a flower bathtub for the full-blown Lulur experience and feel reborn again. Check it out! Reflexology is not to be confused with a regular foot massage (which is also quite delightful!). This pressure point massage is a very common health treatment in Indonesia, rooted in ancient China and it has got many therapeutic benefits. The knowledge behind this healing massage spread to Indonesia and you will find it in every spa on Bali Island. Reflexology is based on the theory that there are pressure points on our feet and hands that connect to inner organs and thus, with massage, healing can take place as energy blocks are dissolved. For this massage, you will sit down in a super comfy reflexology chair. Lay back, close your eyes and let the therapist do the rest. A great place to try reflexology in Bali is at Cozy Spa on Sunset Road in Kuta. Or you can also try with a deal here. In need of a hair wash? Don’t bother making the effort of washing your hair yourself, get a cream bath! A cream bath is not a bath, it is a spa treatment for your hair and it is wonderful! You can expect a firm massage of the scalp, shoulders, neck and arms combined with nurturing hair masks, hair steam and it ends with a hair wash and blow dry. Your hair looks shiny and smells amazing – you could have one of these every single day! Give your head and your hair a well-deserved break and get a cream bath while you can. Give it a try here. 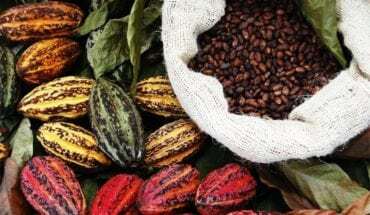 Rich local ingredients are mashed and blended to create natural scrubs and creams for the traditional facial. A journey of scents where you can relax with eyes closed. Don’t expect a facial like you get them at home. The therapist will apply moisturizers, masks and scrubs and she will massage your face, neck and shoulders. 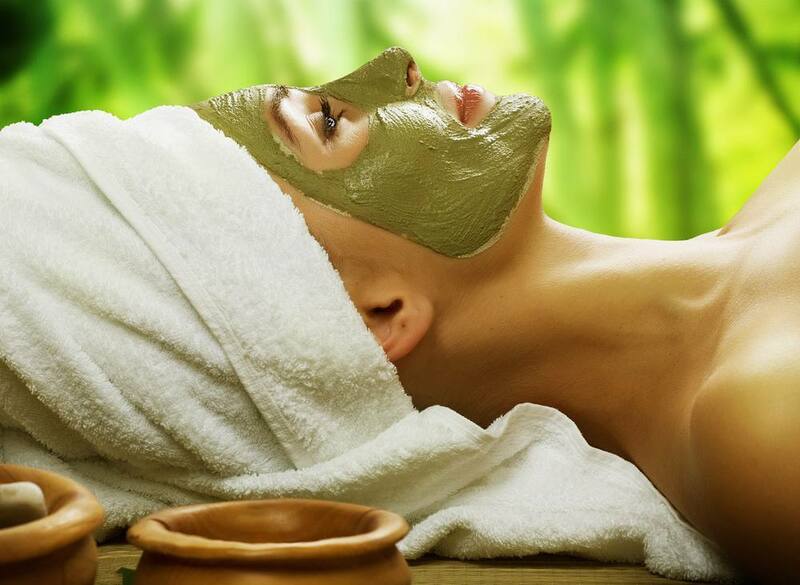 Even though it may not remove your blackheads, the Balinese facial is very relaxing and nourishing for the skin. Try it out. Who doesn’t love a good manicure and pedicure? Some extra attention to the hand and feet topped off with nail polish of your choice. Getting a pedicure & manicure is also great for a girls’ trip to Bali or even a hen’s party! Sitting right next to each other, feet up, talking, laughing, gossiping and the only thing you need to think of is what color nail polish you’d like. Perfect! 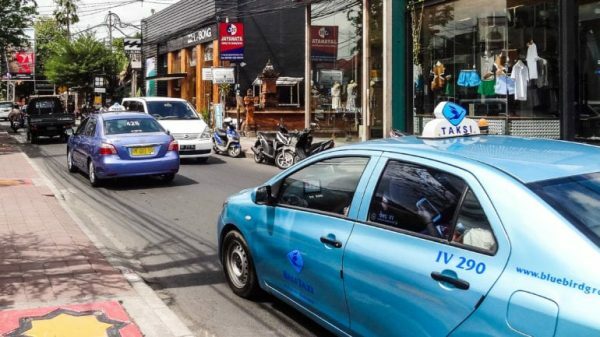 Get a deal for a manicure in Seminyak here. Ear Candle is an ancient therapy to remove ear wax, relieve pressure in the ear and cleaning the sinuses. A long hollow tube of cotton and wax is gently inserted into one ear. The other side of the tube is lit and as the candle gently burns up, the warmth and the smoke help to loosen the ear wax and it also gently massages the eardrum. With soft music playing, candles and incense burning in the room and lying down comfortably on one side, the ear candle treatment is calming, bringing you into a state of deep relaxation. Clean your ears the traditional way like people have done for centuries with an ear candle session in Bali. One ear usually takes 15 minutes so the total treatment is half an hour. Check it out. For those ladies who dare, the Ratus treatment is a traditional Indonesian steam pot to clean ‘ Miss V’. A pot is filled up with burning charcoal, spices and herbs and you sit down on a special chair and let the herbs do its magic. It certainly is a new experience! Try it out here. Always wanted to lay back in a bathtub filled with flowers? In Bali you can! In fact, almost every spa offers this experience. It is not only utterly relaxing, you can also take some amazing selfies, surrounded by pink and red flowers. Surely, those photos will make everyone jealous back home. Get a pampering session here. Feeling lazy? 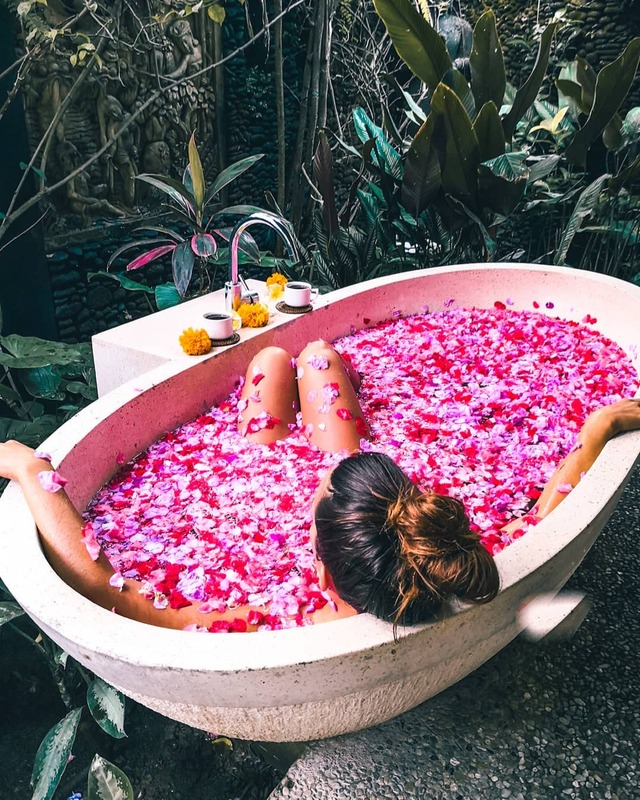 You can also have a flower bath at your Bali villa! The villa staff will be more than happy to help you. The hot stone massage is another old-age healing massage that originates in China. Smooth, flat river stones are heated and placed on your body during the treatment and the therapist also uses the stones to massage your entire body. The pressure combined the warmth of the stones helps to relieve tension, increase blood circulation and eliminate toxins. A must-try! This spa treatment originates from India – it is a traditional Ayurvedic treatment where warm oil or herb-infused milk is poured over the forehead – the third eye. In Bali, there are lots of spas offering this healing treatment. Shirodhara can cure headaches, insomnia and allergies, but above all, the treatment is relaxing, reviving body, mind and spirit. Shirodhara usually lasts 1 hour. At L’Ayurveda in Kerobokan, you can enjoy a traditional Ayurvedic spa package that includes Shirodhara. Check it out here. 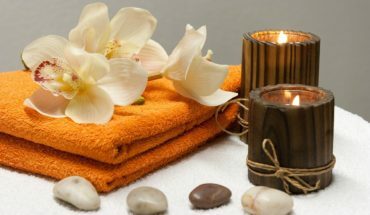 For this article, we partnered with EazySpaDeals, a one-stop Wellness & Beauty online booking platform. You can find several spa and salon deals on the website. All you need to do is get the voucher and enjoy the treatments of your choice at a great price!